A lot of young bands I’ve met on the road ask me, “How do you book these venues?” Venues are inundated with an onslaught of emails, phone calls, physical press kits (just kidding, no one does these), etc. and it can be a hard sell when you’re a green band in a fresh market. And I realize the previous phrase sounds like an environmentally-friendly hippie tour of organic grocery stores, but it’s not. This is a screencap of a recent pitch email and I’m giving you my gold here, kids. This is how we’ve booked about 300 shows this year. SO. Don’t copy me and ruin my cred. Let’s break down the elements of what make a solid pitch email and you can use these to build your own pitch. The music business is the most informal industry in America. Nowhere else can you consistently call everyone “dude,” drink a beer while performing your duties, or call a flannel shirt your nightly uniform. That doesn’t mean that you can wave professionalism off as a superfluity. It won’t do to call a booking manager “dude” the first time you establish contact. Conversely, we’re not looking for, “to whom it may concern.” These are busy, real-world folks who want to know that you know what you’re doing — not that you’re wearing a tie. You should always find out the name of the person in charge of booking and address them by it. Even if you are using a template, this will communicate that you have taken the time to dignify the person you’re contacting. Always thank them for their time. The fact that they’re reading your email means they’re doing you a favor. Never act entitled. You’re providing a service, yes, but no one owes your band anything. As you can see from my pitch email, I’ve used three lines to identify myself. By saying that “I represent” the band, I’ve employed a secret reinforcement because some venues lend more credibility to emails from agents rather than artists themselves. Some bands create pseudonyms or character booking agents and book through these cardboard identities, but I’m inclined away from artifice. It can create awkward situations. I am technically the band, but I also represent it, so this is just a well-phrased truth. I’ve bolded my band name so it stands out in the plain text. Hometown, current situation, trajectory. Keeping everything simple and clean is paramount. Press. I’ve included a few write-ups — reviews, interviews — from notable press outlets. The variances included display the spread of our travels as well as the diversity of our engagements. All the hyperlinks are neat and double-tested. A bad link equals a bad pitch. RIYL. “Recommended if you like…” Sure, we don’t want to compare ourselves to others band because “we’re unique,” but the chances are if you can’t elevator-pitch your band’s sound, you’re not familiar enough with it yourself. Everyone sounds something like someone. And please don’t say, “We sound like Mumford & Sons.” That’s what you tell folks who only listen to top 40 radio. Be creative, but be accurate and specific. “We sound like a tropical thunderstorm inside of a Mason jar on your grandma’s rocking chair” doesn’t mean anything either. Web presence. Two videos, our absolute best, are embedded conveniently in the email. If your band has a website URL that includes “.wordpress” or “.blogpost”, your band doesn’t have a website. Own your domain. Create a homogenous brand for every avenue of your web presence. 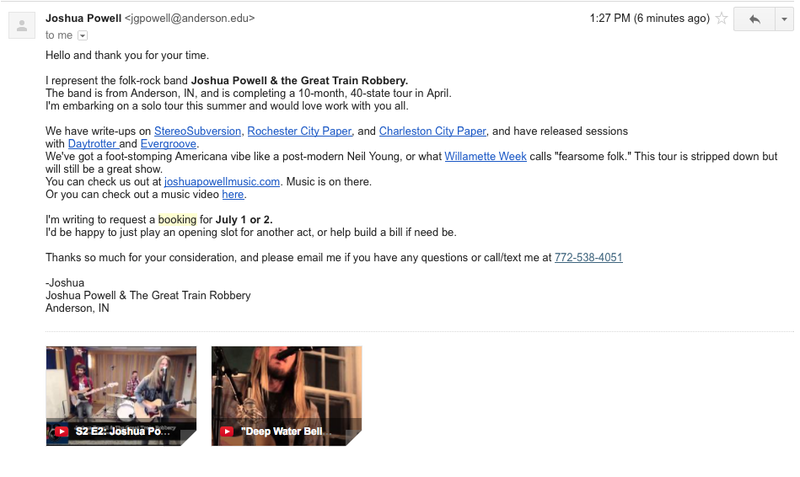 You can find my band at joshuapowellmusic.com, at facebook.com/joshuapowellmusic, noisetrade.com/joshuapowellmusic, etc. See the trend? Let the booker know that your web presence is strong and uniform. Our website acts as our EPK because a photo is stickied, music is embedded, and video is accessible. Having a professional website isn’t a thing of the past and having a Facebook isn’t enough. I know you want to just be an artist, but you can’t be. You have to be a businesswoman. Clarity is the crux here. Don’t just say you’re requesting a booking — give them a specific window. Check their event calendar to make sure you’re not asking for a Tuesday night at a bar that only books weekends. Similarly, have the decency to check so you’re not asking to play the Friday night when [other, bigger band] is playing there already. I try to always present options. This is tricky with routing bigger tours, but flexibility can pay off. Additionally, put the onus on yourself. Language that reflects your work ethic will cut through the clutter. “Looking forward to working together.” > “So hopefully we can work something out.” If you have the resources and time, offer to help build a bill that will maximize draw. A word on draw: this will be the first question many venues will ask. Destination venues especially have no reason to book you if you can’t get people out to their club. Lying about your draw will never help, and will actually burn bridges you can’t afford to burn. There’s nothing more disheartening than playing to an empty room. When you’re hitting new markets, go for the smaller clubs with built-in crowds or find local bands to bookend you so you can catch their fans. Or combine those two strategies for a nigh-surefire success. Of course, these are guidelines, not rules, but this has worked efficiently for us. When you’re booking a venue for a return trip, supplement your email with draw estimations, personalizations, and reminders about your last performance there. This email should be entirely different so you don’t appear robotic. It’s also important to advance your show and make sure that all parties are in agreement on terms and conditions. Part 2 of this blog will be posted at a later date and will cover how to send follow-up emails and advances. Helpful? Have a pitch email you’d like me to review? Use the contact form on my website and I would be more than happy to edit or proof your band’s pitch email. We’re in this together, y’all. Let me know if I can be of service. Short, sweet, and to the point. I always try to personalize my bookings a little bit towards the bar/area that we are going to play. I hate writing the same thing over and over to pubs/bars/festivals that can be copy paste. Yes, you’re going to have to obviously copy/paste part of it (press, RYIL, and web presence). Something like, “we would love to come to “Name of Pub/Venue/area/town/something here” to share our music with you.” But thats my two cents. Looks good, sounds great. Thanks for sharing! This is a GREAT article on how to book as a band. Excellent work, Joshua! Thank you, Brad! Still thankful that it scored us a spot at Evergroove. And we’re thankful to have met you all. You’re always welcome here. What kind of work/research goes into booking a show in a town that you’ve never been? I’ve had a somewhat irrational fear of playing in a venue that could be dodgy or dangerous, or is simply the “wrong place to be” (Think about the scene in Blues Brothers when they play in a redneck bar and get bottles constantly thrown at them). With that being said, I always like to SEE the venue in person before I decide to play. Using a resource like Indie on the Move or Yelp to study user reviews and such is probably your best bet. In a touring scenario, it’s not feasible to actually see the venue before you play there, but you can get a pretty good idea if you do enough internet digging!